Long ago, there was a delightful activity that people would engage in. One person, typically of a somewhat smaller frame or height, would jump onto the back of another. They’d throw their hands over the larger folk’s shoulders and wrap their legs around the midsection and literally ride them, perhaps shouting out excited cries or simply enjoying the respite from having to walk around. They had a lot of different names for this grand activity. It could be a piggie back ride or, occasionally, even playing horsie if the other were to get on their hands and knees. But, that was ages ago. Ever since we all got to see the excitement of the Star Wars films, people discovered a far better name for the activity.Yoda rides! We all enjoyed watching the crazed swamp acrobatics of Luke on the jungle planet of Dagobah. The adorable implausibility of a green master Jedi riding on the back of a young guy is too ridiculous to ignore. Plus, anyone doing the riding gets to be Yoda while the one giving the ride is still at least a Jedi-in-training! Win-win-win! 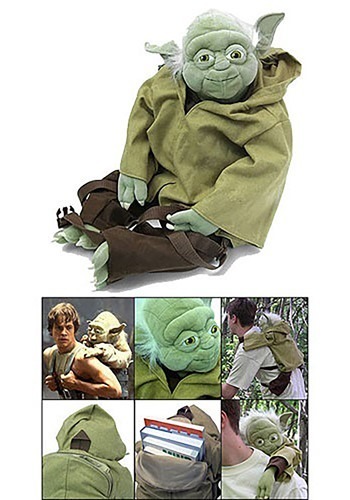 So, transform to your Jedi future with this Yoda Plush Backpack with adjustable straps, a zipper compartment, and the officially licensed Yoda form and may the Force be with you!